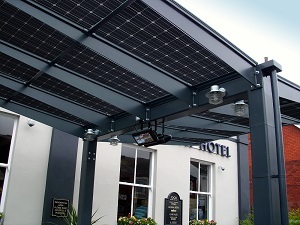 Able Canopies Limited has always been at the forefront of product innovation and has recently teamed up with Europe’s leading solar panel manufacturer – SolarWorld, to create a range of solar canopies that not only provide all-weather shelter but also earn money from generating electricity from the sun’s rays. And it’s not only the financial benefit, installing a solar canopy sends a positive message that a company or organisation is looking to minimise their impact on the environment through reducing their carbon footprint and supporting renewable energy. Unlike solar panels fitted to existing roofs, a free standing solar canopy can be positioned to maximise the catchment of the sun’s rays, which is perfect if an existing building is not ideally orientated or if shading is a problem. Chris Penders, Business Development Manager of SolarWorld UK said, “Able Canopies have chosen to use our state-of-the-art Sunmodule Protect with innovative glass technologies on the front and the rear. Embedding the cells in glass-glass ensures optimal protection against mechanical loads and environmental factors. The modules light permeability expands its range of application and opens up new ways to integrate it aesthetically into canopies. Working with our technical team, Able can integrate this product perfectly into any design and have created a unique portfolio of canopy structures”.